COLUMBIA, S.C. — While South Carolina avoided Irma’s eye, the massive storm caused severe flooding and tropical storm-force winds that left hundreds of thousands without power Monday. 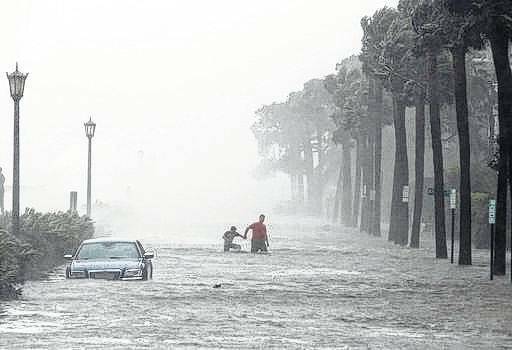 Tropical Storm Irma brought wind gusts of up to 72 mph on Folly Beach and Charleston’s third-highest-recorded storm surge as the center of the storm moved some 250 miles away through Florida and Georgia. The nearly 10 feet (3 meters) of water that pushed a mile inland in Charleston was nearly 4 feet above a typical high tide and surpassed the destructive surge caused by Hurricane Matthew last October. It ranked behind only Hurricane Hugo in 1989 and a 1940 hurricane. By Monday afternoon, about 250,000 customers lacked power across the state. Gov. Henry McMaster knew of no fatalities, but he urged people not to drive. By 4 p.m. Monday, flooding and downed trees closed more than 160 roads in 10 counties. “There’s no need to put yourself or your family or first responders at risk,” he said. Residents of the Charleston peninsula waded in waist-deep waters, and waves pushed the iconic graffiti boat near Folly Beach back into the waves. The boat has been repainted continually since Hurricane Hugo stranded it along the roadside in 1989. At least seven people had to be rescued in Edisto Beach, a town under evacuation orders about 30 miles down the coast from Charleston. A family of four “decided all of a sudden they’d leave,” Edisto Beach Mayor Jane Darby told The Associated Press. Their vehicle flooded out on a curve in front of the beach pier, as ocean water poured into the streets. They were among an estimated 70 people that stayed in the town of 530, despite McMaster’s order Friday night. Three media employees also had to be rescued, Darby said. Edisto Beach was among the areas hardest hit by Hurricane Matthew. Irma washed away dunes restored earlier this year with a $17 million beach restoration project. McMaster’s order late Friday required people on seven barrier islands, plus Edisto Beach, to begin evacuating Saturday morning. About 44,500 people live in the evacuated areas, most of them on Hilton Head Island. Even McMaster wasn’t immune from the storm’s wrath. A massive oak tree fell Monday on a two-story apartment building he owns in Columbia by the University of South Carolina. The college students living there are safe, but the damage to two apartments shows the storm is wreaking havoc across the state, McMaster said. “It can happen anywhere. We didn’t expect that at all,” he said. The fallen tree left up to eight people without a home, but no one was injured, according to the Columbia Fire Department. As of noon Monday, 25 shelters were housing nearly 900 evacuees. McMaster visited one of the shelters at a middle school in Columbia near where he grew up. He said the dozens of people inside came from all over the East Coast, including Savannah, Georgia, and Key West, Florida. Pedestrians walk by a flooded car Monday on a street as Tropical Storm Irma hits Charleston, S.C.